Sleep Coach - Analyzes Sleep and Tells you how to improve it! Lifetime Warranty - Best and only in the Industry!! The EverSleep 2 wrist pulse oximeter was designed not only to continuously monitor your blood oxygen saturation (SpO2) and heart rate while you sleep but with advanced technology it can analyze the quality of your sleep and tells you how to improve it!! The EverSleep 2 Sleep Oximeter is much more capable than other devices on the market such as fitness bracelets and smart watches. EverSleep 2 wrist oximeter connects to either your iPhone/IOS or Android device via a Bluetooth connection. You first download and install the app from either the App Store or Google Play. Launch the app and the easy to follow on screen instructions will guide you to setting up and preparing the device for use during sleep. The EverSleep oximeter transmits sleep readings to the app throughout the period of use. When you wake simply grab your phone/tablet and view results. 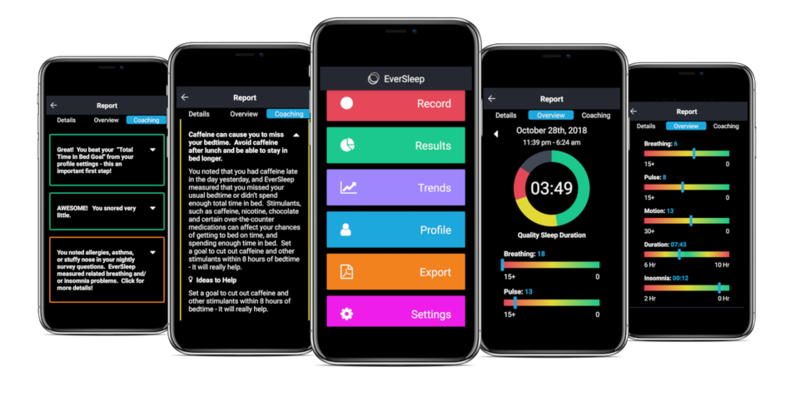 The EverSleep 2 application not only accurately tracks and records important sleep data and trends but offers insight on how to improve your sleep. The easy to navigate mobile dashboard allows the user create, review results, offer sleep improvement suggestions (based on user input and sleep data) and share sleep reports. EverSleep sleep coach asks you nightly questions and takes into account your sleep habits, environment, food intake, screen time, medications and conditions. The coach provides actionable suggestions based on your input to help you increase your quality of sleep. EverSleep generates easy to read results. Results are in graphical, numeric or in coaching tips that highlight the data offer actionable changes to improve sleep. If you don't follow the instructions you will end up having to follow the instructions. It's super easy to use and the reports and sleep tips are very helpful in managing my sleep. My quality of sleep has increased. Use it almost every night. I like it so far. Will let you know more after a couple more nights. Extremely comfortable to use during sleep. Don't even know it's attached to me. I can put the oximeter on me by myself and the sensor design is the best I've used. The app is pretty straight forward. Just follow the instructions when the app launches and you should be fine. Report was easy to read and I like that there are several different ways to review your sleep data. The most interesting thing you see is movement during sleep. The oximeter senses movement and shows how much you move over time. The report will show you how much time you had "quality sleep" during the night. CONS: No O2/Heart rate display on the oximeter. You can only see the data after you generate the report. No battery indicator. Says 16 hour battery life but I wish you could see how much life is left. They include tape to secure the sensor. Tried using sensor without it but it didn't seem like it would stay on during the night. Lightly taped the sensor and it did not come off. Overall I love the unit. Would buy again. Can't believe they offer a lifetime warranty on this but it seems well made.